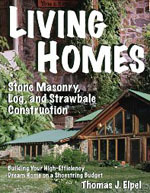 Living Homes: Stone Masonry, Log, and Strawbale Construction; Building Your High-Efficiency Dream Home on a Shoestring Budget, by Thomas J. Elpel, 2010. Originally published in 1998, this is the sixth edition. This hefty book (250 pages, 8.5" X 11") is chock full of detailed information, personal musings, photos and diagrams, and practical tips. Thomas Elpel is a do-it-yourselfer after my own heart, and what he has compiled here chronicles his adventures of building his own home in rural Montana as well as experiences with other building projects. He and his wife were forced by circumstances to find inexpensive solutions for all of the challenges of building their home, and they managed to do this without sacrificing their commitment to energy efficiency and sustainability. Their home is a true hybrid, with the first floor being slip-formed stone masonry and the second story of logs, all sourced locally and ecologically. Thomas explains in great detail exactly how he put together this house, sufficiently for others to follow his lead without much more need for instruction. In addition, the book is liberally dosed with Thomas's philosophy of how to homestead ecologically in the 21st Century. He starts with how to choose an appropriate location, then proceeds to describe strategies for disaster-proofing your home. He emphasizes how important it is to define the goals you have for your home before even coming up with a design. Part Two of the book explores principles of energy efficiency, delving into a discussion of the need for excellent insulation, coupled with thermal mass and solar gain for a truly ecological house. The pros and cons of various insulation systems are defined, with charts of R-values. etc. There is a chapter devoted to interior air quality. Part Three launches into the nitty gritty of exactly how to build using the methods that the author is familiar with. There is a thorough review of various strategies for creating footings, foundations and floors. This leads to a primer about the properties of concrete and how to mix and pour it. The instructions for building stone walls are specific to slip-forming, which tends to be fairly straight forward and simpler for folks who are not skilled in the art of free-form stone masonry. Thomas admits that slip-forming may result in a less aesthetically appealing result, but the advantages are speed of building, ease of reinforcing the wall, and the option for easily incorporating insulation right in the middle of the wall, which has a tremendous thermal advantage. A whole other approach to making stone walls is described in some detail: tilt-up construction, where the walls are all created flat on the ground and then later lifted with a crane into place. Obviously these walls need to be extremely well planned and reinforced to survive the lifting procedure, but this method can be done rather quickly. The author demonstrates how this is done using an example of a friend's house that he helped build. The log-building technique that Thomas chose to use for his house is one of the simpler approaches, where little notching and careful fitting and trimming is required. Round logs are just stacked one on top of the other, using rebar pins to hold them in place. It is possible to build entire walls this way, and then cut out doors and windows later. The spaces between the logs are eventually insulated and chinked to make the wall air tight. The basics of strawbale building are presented in one chapter, detailing how a large load-bearing strawbale shop was built. The information about strawbale is not as thorough as it is with the previous chapters on stone and log building, but there is enough of an overview to give the reader an idea of what is involved. All of the wall-building techniques described so far require a framed roof of some sort, and the author goes into some detail about the possibilities for doing this. One method shown is fairly simple and straight forward, where a log ridge pole is placed first, and then rafters are bolted together on top of this, supported at the other end with another log. This can then support a variety of roofing materials, such as metal sheets or shingles. On his own house, Thomas used recycled pieces of thick structural insulated panels (SIPs) to piece together a roof. For their floor, Thomas and his wife became experts at making "terra tiles," which are cast-in-place tiles composed of earth, cement and colorant. There is enough detail in this chapter to attempt a similar project. The rudiments of wood-frame carpentry are presented as options for making interior walls and floors. Window and door options are explored, with the pros and cons of various types of glazing pointed out. In order to present a thorough overview of all of the basics of house building, the author also has surprisingly comprehensive chapters on plumbing and electrical wiring. This includes a look at the options for rain water catchment, gray water recycling, waste management, and even capturing biogas. Strategies for solar water and space heating are discussed. An extra bonus is a lengthy chapter on the theory and details of building a masonry stove, which shows how they built one for their home. This is probably the most energy efficient method of heating with wood possible. Another do-it-yourself chapter shows how they built their own concrete kitchen countertops. A final chapter discusses ways to save money by using recycled paints. All-in-all I give this book very high marks for providing useful information compiled in a logical and detailed manner. A person really could attempt to build their own house using nothing but this book as a guide, which is more than can be said for most building how-to guides. At times the author becomes rather chatty and some of the text could use some editing, but overall, the read is interesting and very informative...well worth reading, especially if you are thinking about building your own energy efficient and economical house. Hi Kelly I just came across your website. What a wonderful resource you have put together over the years. I am sure it has provided may hours or expert advise. I also support green home building since then because I think this is the time to focus in our environment and building homes that are environment friendly will help our environment through saving some energy.